Hi guys Its me agian. I"m racking up some blog time this year. First let me say thanks for all your support, and comments. I got a job working for the Auburn University Horticulture Dept. this summer. I have recieved lots of free plants and have almost completed all the major planting for the yard. 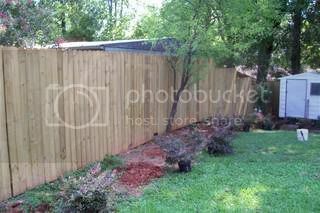 A month or so I got 14 Azaleas that I planted around the deck and along the back fence line. You saw those in the previous blogs. But last week I got 13 loropetalums, that I planted along the left fence line. This is the before picture. I cleared out the rose of sharon, and the roses, which I replanted in containers. I will blog about them later. And this is the after picture.I mulched right under them but i'm going to just let the grass grow in until they get bigger and by then the plant will shade out any grass and weeds. I am trying to talk my husband into getting a soaker hose to run down the length of the fence between the loropetalums to reduce water time and use. 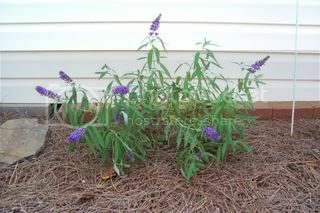 This is a picture of the butterfly bush I planted last year. It is finaly starting to fill out and it has a nice amount of blooms for its size. Thank you everyone for continuing to follow my journey with me. Looking good, Jenn. What a dream job. Oh what I wouldn't give to have a job that gave me free plants!! I love your butterfly bush - mine didn't flower this year sadly. The newly mulched bed is great and I'd love to see it again once the plants all mature. Well Faun...things are really looking up there. That butterfly bush looks really good this year. It's a nice colour too. 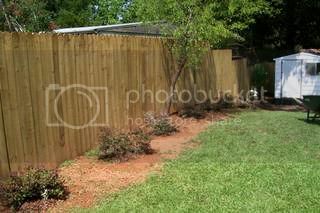 You have done so well with that yard and it's borders. Really looks great!! wish i could find someone for some free grass lol! !